(TibetanReview.net, Nov16, 2017) – Norwegian MPs Ola Elvestuen from the Liberal Party and Petter Eide from the Socialist Left Party have undertaken to re-establish a Parliamentary Support Group for Tibet in their parliament during their meeting in Oslo with the President of the Central Tibetan Administration (CTA) at Dharamshala, India, Sikyong Lobsang Sangay on Nov 14. The duo gave their undertaking to the Sikyong when he called on them in the parliament building, said the CTA on its Tibet.net website Nov 14. The statement said the MPs voiced “clear support for human rights and environmental issues in Tibet”. Petter was stated to be also a former Secretary General of Amnesty Norway. The Sikyong was also stated to have addressed a breakfast meeting at the CIVITA, described as a leading Norwegian liberal think tank, on the topic “Economic interests or human rights: How should liberal democracies interact with China?” The co-panelists were stated to be John Peder Egenæs, Secretary General of Amnesty International Norway, and Stein Ringen, Visiting Professor at the Department of Political Economy, King’s College London. 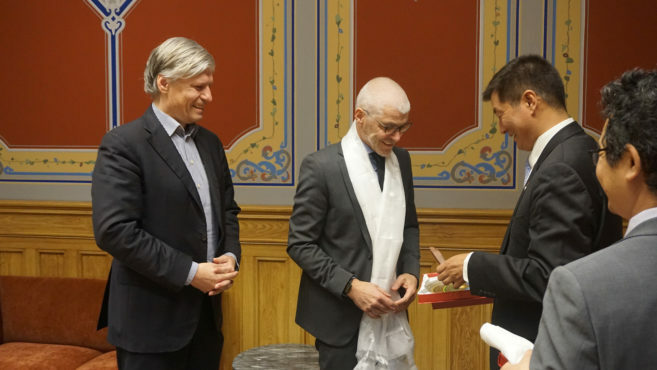 The Sikyong has also met with Bjorn Engesland, Secretary General of Norwegian Helsinki Committee, over a working lunch. The Sikyong is on a 17-day, five-nation tour of Denmark, Norway, Sweden, Canada and England which began on Nov 13.